Sea level rise and accompanying coastal squeeze will drive changes in marsh spatial configuration and connectivity affecting how fishes utilize the marsh. 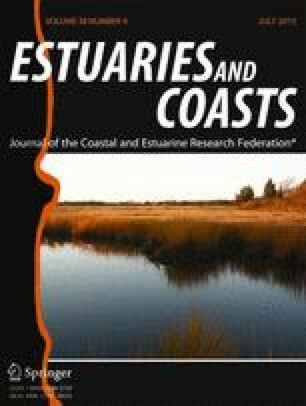 We investigate how sea level rise and coastal squeeze affect the spatial distribution, configuration, and connectivity within tidal marshes in a landscape context. Using spatial analyses, we compare two outputs from a process model: one with constant vertical accretion and the other with a more optimistic prediction that rates of vertical accretion will equal rates of sea level rise. We use landscape metrics on the model outputs to evaluate the landscape scale changes that occur in a selected marsh at the National Estuarine Research Reserve (NERR) site in Wells, Maine, USA. We found that moderate sea level rise would benefit marshes by expanding their area and maintaining habitat spatial complexity. However, rapid sea level coupled with stressors like coastal squeeze is likely to result in smaller and more dispersed marshes with simpler patch edges and less connected patches. Such features indicate lesser potential for food and refugia. Funding was provided by Geomatics for Informed Decision (GEIODE) (Project PIV-41, “The Participatory Geoweb for Engaging the Public on Global Environmental Change”). We thank Dr. Jeanine Rhemtulla for useful discussions on landscape ecology techniques and Dr. Margaret Kalacska on the processing of LIDAR, multispectral remote sensing data, and for providing access to powerful laboratory computers. We appreciate the comments of two anonymous reviewers, which helped to improve the manuscript. Michele Dionne graciously provided us with the data needed to assess how the relationship between marshes and fish use might change with rising sea levels. Dr. Dionne was not only a personal friend, but a valuable colleague and mentor who helped us realize the importance of marshes to estuarine fish. J. Jenness, B. Brost, and P. Beier. 2011. Land Facet Corridor Designer: extension for ArcGIS. Available at: http://www.jennessent.com/arcgis/land_facets.htm Jenness Enterprises. NOAA. 2010a. Coastal Lidar: National Oceanic and Atmospheric Administration. http://www.csc.noaa.gov/digitalcoast/data/coastallidar. R Development Core Team. 2010. R: a language and environment for statistical computing. Viena: R Foundation for Statistical Computing. Retrieved from: http://www.R-project.org.